Community members welcomed home Army Specialist Dustin Largen at Veterans of Foreign War Post 4600 Saturday, September 15, 2012 in McHenry. Mike Greene - mgreene@shawmedia.com Army Specialist Dustin Largen smiles while surveying the crowd gathered for his welcome home celebration Saturday, September 15, 2012 at Veterans of Foreign War Post 4600 in McHenry. Largen served in the Army's 82nd Airborne Division, serving in both Iraq and Afghanistan during his four-year enlistment. 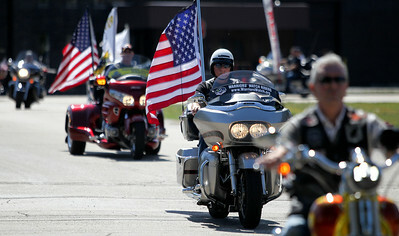 Mike Greene - mgreene@shawmedia.com Members of the Warriors' Watch Riders and the Patriot Guard Rider pull into Veterans of Foreign War Post 4600 during a welcome home celebration for Army Specialist Dustin Largen Saturday, September 15, 2012 in McHenry. Largen served in the Army's 82nd Airborne Division, serving in both Iraq and Afghanistan during his four-year enlistment. Mike Greene - mgreene@shawmedia.com Army Specialist Dustin Largen signs Marine Veteran Ken Keller's jacket during a welcome home celebration Saturday, September 15, 2012 at Veterans of Foreign War Post 4600 in McHenry. Largen served in the Army's 82nd Airborne Division, serving in both Iraq and Afghanistan during his four-year enlistment. 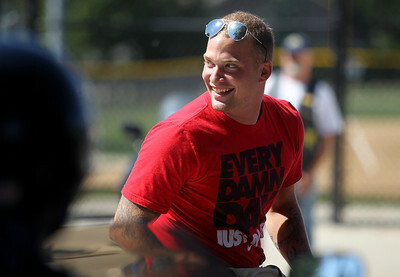 Mike Greene - mgreene@shawmedia.com Army Specialist Dustin Largen smiles while pulling into Veterans of Foreign War Post 4600 during a welcome home celebration held Saturday, September 15, 2012 in McHenry. Largen served in the Army's 82nd Airborne Division, serving in both Iraq and Afghanistan during his four-year enlistment. 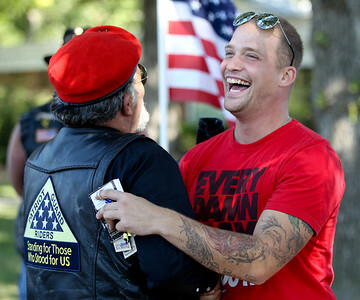 Mike Greene - mgreene@shawmedia.com Army Specialist Dustin Largen laughs while receiving a hug from Army Veteran and Patriot Guard Rider Chuck Serpe during a welcome home celebration Saturday, September 15, 2012 at Veterans of Foreign War Post 4600 in McHenry. Largen served in the Army's 82nd Airborne Division, serving in both Iraq and Afghanistan during his four-year enlistment. 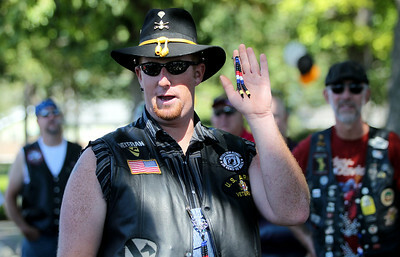 Mike Greene - mgreene@shawmedia.com Army Veteran Anthony Ray Diller explains the meaning of beads being presented to Army Specialist Dustin Largen during a welcome home celebration Saturday, September 15, 2012 at Veterans of Foreign War Post 4600 in McHenry. Largen served in the Army's 82nd Airborne Division, serving in both Iraq and Afghanistan during his four-year enlistment.